The EZ Stretch Traction Handles provide added benefit to inverted stretching and decompression. With the muscles in your lower back relaxed, pushing on the handles can help to increase the traction and enhance your stretching experience. The handles can also be used as a tool for intermittent traction and oscillation. Practice Intermittent Traction and Oscillation: By rhythmically pushing, then releasing pressure on the handles, the user can rock the table up and down in a controlled manner. Oscillation is a great method of inversion for people who may not be comfortable inverting statically at one angle for any extended period of time. Achieve the Benefits of Full Inversion: With the muscles in your lower back relaxed, pushing on the handles can help to increase the traction and enhance your stretching experience, even at a mild angle. Push-Button Release from Full Inversion: Easily unlock fron the fully inverted position with a firm push on the traction handles. Two Settings: Based on the user's height and intensity of stretch desired. I have severe headaches due to spondylosis of cervical spine, requiring ablation periodically to control the pain. 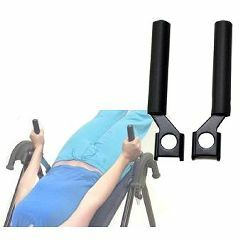 Any one had any experience relieving pain with inversion therapy? The combined weight of these EZ Stretch Traction Handles is approximately 4 lbs.